The Red Cross, not known for exaggeration, calls it a “humanitarian crisis”. The “it” is, of course, the state of the NHS and its A&E services in particular, as winter takes its toll. Three times as many NHS trusts are in deficit as a year earlier, key targets such as waiting times are being missed on a spectacular scale. The NHS remains one of Britain’s most cherished institutions. And yet, it seems that significant numbers of the electorate are very slow learners: The Tories can’t be trusted with the NHS!! 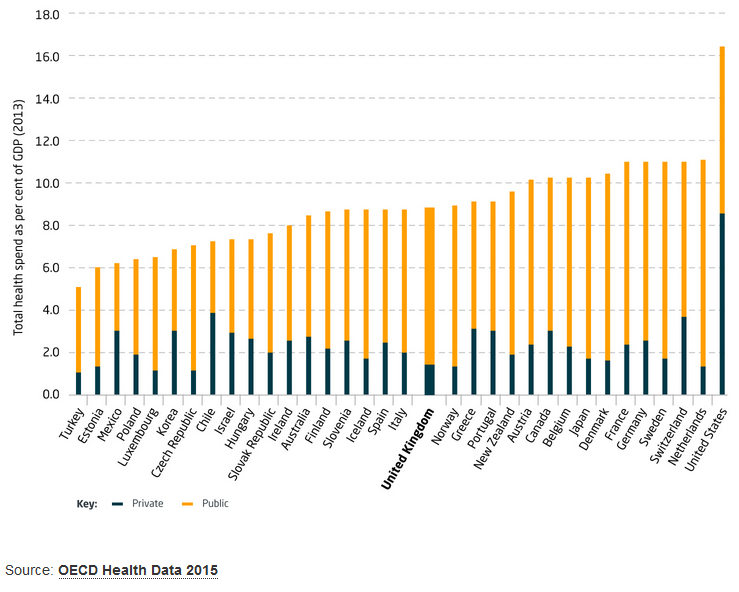 It can be seen that most of our comparable countries in the developed world spend more than the UK – the USA spectacularly so. 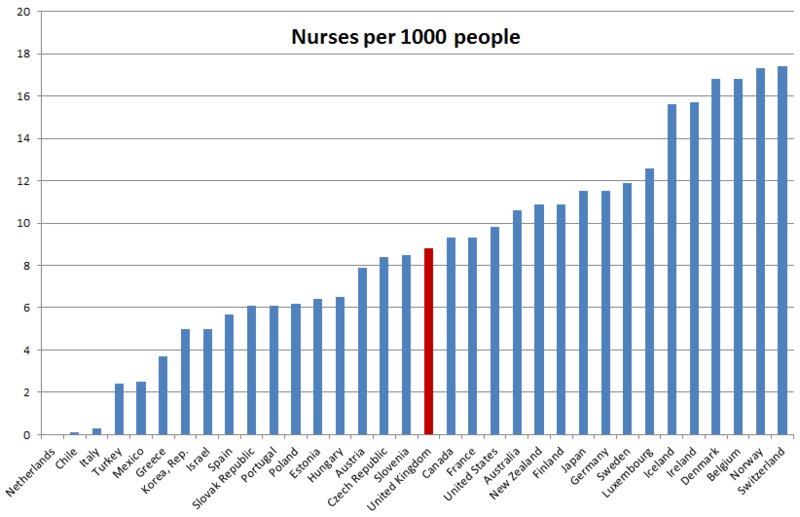 The obvious consequence of this is that the NHS is less well-resourced than its main European neighbours (but not the USA! – see below). 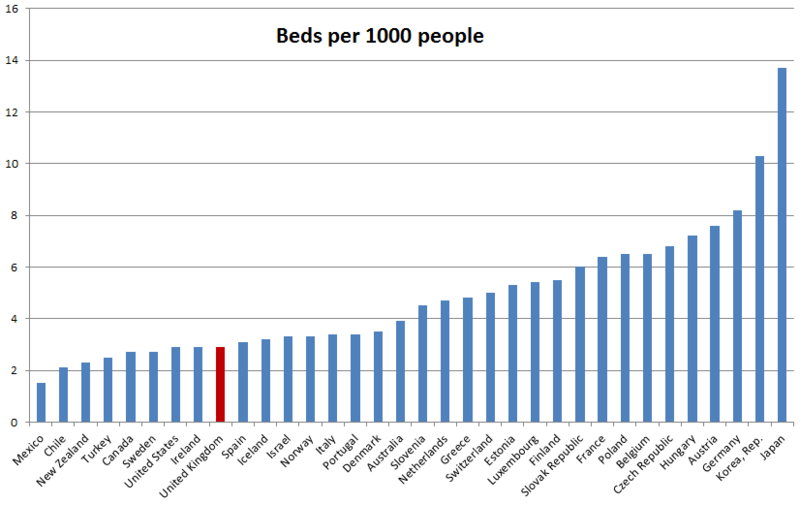 But perhaps the most shocking of all is Britain’s incredibly low provision of hospital beds: see below. When you add in the “bed blocking” caused by draconian cuts in social services budgets over the past few years, it’s easy to see why “running out of hospital beds” is a daily news item. It’s not just the cold weather and feckless patients, it’s the result of government policy. It’s perhaps worth pointing out something else that jumps out of these graphs. 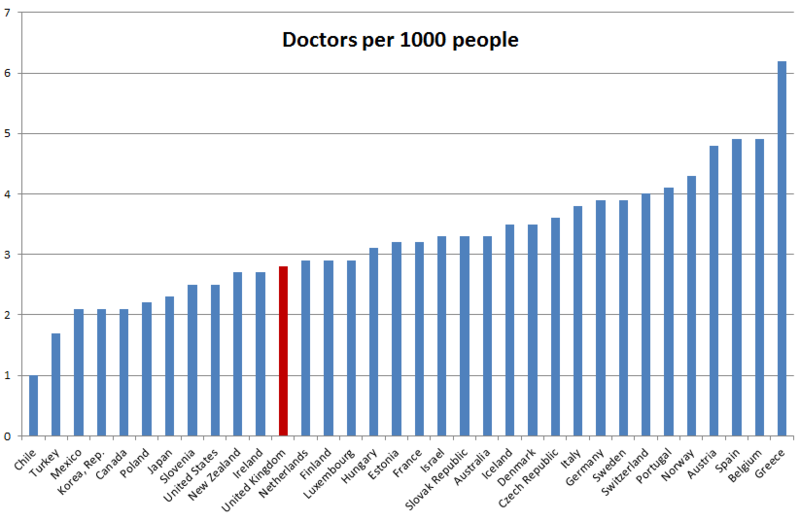 That’s the spectacularly poor performance of the USA healthcare system. Despite the eye-wateringly high spend, Americans get very little for their money – as the graphs above show in terms of doctors, nurses and hospital beds. US life expectancy is lower than the UK and EU average, its infant and post-natal mortality rates are practically third world standard. A stark warning is the fact that a significant faction of the Conservative party wants to undermine and destroy the NHS to bring in something more like the US system. Clearly, the Americans are being conned big-time. Their dollars must go to the fat profits and the spending on major lobbying and propaganda campaigns of the private US healthcare companies. You have been warned. All the above information shows how Britain compares to similar countries, using the most recent data available to the OECD. A historical perspective of trends in healthcare spending in the UK is also instructive, as the graph below demonstrates. Background colours on the graph represent Labour (pink), Tory (blue) and Tory / Lib Dem coalition (green) governments. From the 1950s through to the mid-1970s, both Labour and Conservative governments followed similar policies in terms of funding the NHS. Spending rose slowly in line with longer life expectancy and a wider range of treatments available. The period of decline in the late 1970s can be attributed to shock to the economy of the oil crisis and the five-fold increase in the price of oil. 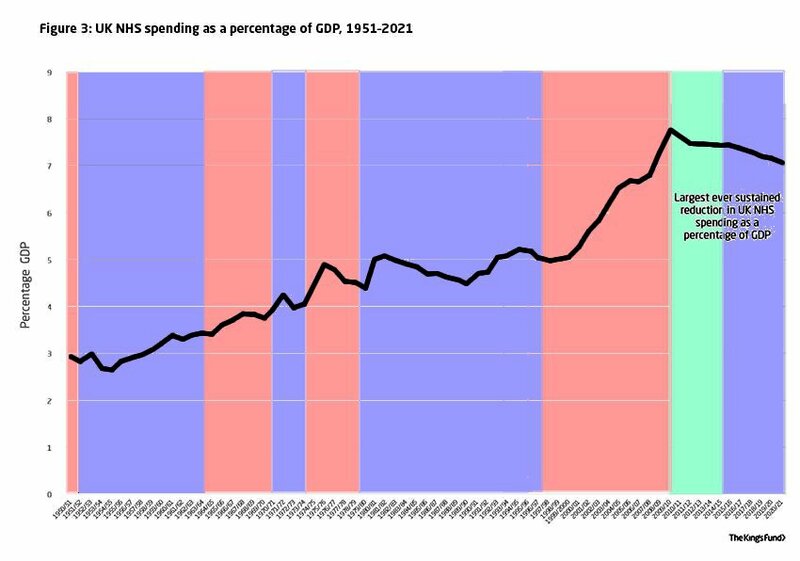 The jump up in the graph in 1980, shortly after Thatcher won the election, is not due to an increase in spending on the NHS. Rather, it is due to the sharp drop in GDP; Thatcher’s monetarism experiment resulted in a sharp recession, wiping out much of British manufacturing industry and the steady jobs with them – never to return. Spending was stagnant through the 18 years of Tory government, mostly falling slowly under Thatcher with a slight compensatory rise under John Major. When Tony Blair won the 1997 election, spending was under 6% of GDP, whilst average spending in the rest of the EU had steadily risen to over 8%. Blair pledged to bring NHS spending up to the level of the EU average: a 25%-plus increase overall. The graph clearly shows a rise to nearly 8% by the 2010 election, but the EU average by then was approaching 11%. Under the 2010-15 coalition, spending was stagnant, despite the continuing increase in demand due to increasing longevity and new, expensive treatments. The graph shows the forecast decline for the Tory years to 2020. This forecast is made by the respected, expert medical charity The King’s Fund, based upon stated government policy announcements. No wonder that Simon Stevens, Chief Executive of NHS England, told the House of Commons Public Accounts Committee on Monday that Theresa May’s assertion that the NHS was getting all the funding it wanted “stretches it” – “it” being the truth. That’s polite speak for pointing out she’s a liar. Which brings us full circle to my original point: how much more evidence do people need that the Tories cannot be trusted with the NHS? Serious attempts are being made to formulate some kind of non-partisan, consensus policy-making to secure long-term funding for healthcare in this country. Indications so far are that May and company are resisting this: she appears always to want to have her own way and dismisses, rather than listens to, dissenting voices. Failing that, we will need some organised, grassroots political movement to get the Tories out of office before they destroy the NHS completely. The fightback must begin – soon.